found this in my phone having forgotten that it was there at the time, and thought it would make a bit of a change to have me speaking after all these glimpses of London. 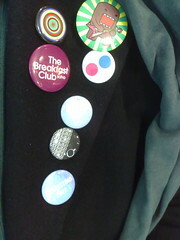 My most popular social objects at the moment are the badges on the lapel of my overcoat. Most of them were around last winter when I was wearing the coat, so I don’t know whether it’s the fact that I’ve added a couple more or something else that makes all sorts of people stop and smile and comment and ask questions. Only today, for example, I happened to be riding in a lift with the Lord Chancellor and Secretary of State for Justice, as you do, and he (for they are one person) said “Oh what are those for?” and I said, “Oh they’re just things I’ve been to” and he said “Mmm… just brightening up your overcoat” “Yes” and so it was that my relationship with Jack Straw MP was everso slightly enriched. I’ve put some notes on the photo on flickr to help people who want to know what each is about. I might as well spell out the detail here too. So from the top, the targetty looking one is from Platform for Art, the programme for putting art on the underground. The one next to it featuring Domo is a new one from my friend Claire who gave it to me to extend my collection. This exchange also gave us the opportunity to share this with one of our friends who’d never seen it before – yes there are such people! Below Domo is my flickr badge – I’m always surprised by the people who have been on flickr for ages, but who need to have that explained to them. Isn’t it obvious? And yes, I know it’s upside-down. To the left in the picture but to my right is my Breakfast Club badge from the cafe in D’Arblay St of the same name, not because I belong to a club that involves eating sausage and bacon or because I carried a torch for Molly Ringwald (though the latter is true and if the former exists, I’d like to know about it) They have them in a basket on the counter, so they’re not as exclusive as you might think. Next down and not very clear is one that Katherine gave me. It depicts creature that is half whale and half training shoe. I have no idea what the picture means, if it means anything at all. Below that, the black one is from likemind. I can’t remember whether it was the lovely Amanda or the lovely Jamie who gave it to me (now that’s going to start a fight) and the one at the bottom is from the goodie bag at Interesting 2007. It says “Interesting 2007” So that’s the only one that wasn’t given to me by a girl then. Each of them is a conversation starter, each has a little story attached, a little story that tells you a little bit more about me. And together, the fact that I wear them says something about me. Perhaps that I’m a nutter and to be avoided, but judging by experience, also that it’s OK to stare and OK to come up and ask me what they’re about. I don’t have to do anything more than wear them to get into interesting conversations with people. If you haven’t a clue why I’m even talking about “social objects” go and read Hugh on the subject.